ORLANDO, FLORIDA-Bing recently attacked Google about changes made to Google’s Shopping section last year and the lack of disclosure they provide search users about it. The only problem with their campaign is that according to some industry experts Bing is guilty of exactly the same thing, which kind of takes the oomph out of their claims of moral superiority and honest search results. He published an in-depth piece that explains what Google has changed about its Shopping section and compares how the two search engines disclose information to consumers. “No matter who’s doing it, search engines forcing businesses to pay for inclusion on their shopping sites without clearly indicating that to consumers is wrong,” says Ali Husayni, the CEO of Millionairium. While the Scroogled campaign has focused on Google’s changes to the Shopping section, regular search results are being infected, too. There are more advertisements and sponsored content pushing the organic results farther down the page, which impacts SEO and search users as well. 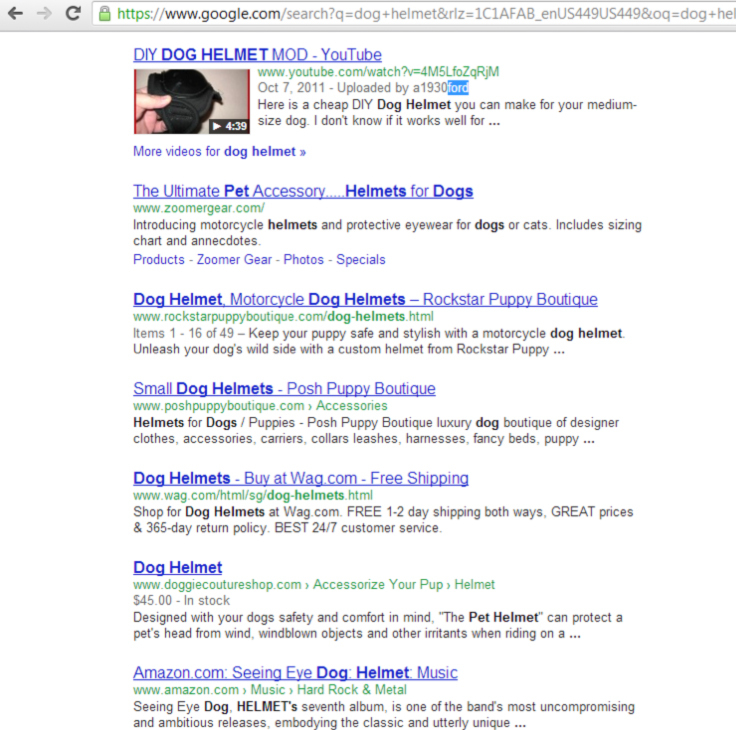 Google ads show up in the top two or three spots of a normal search result. There is a section at the bottom of the page with more ads from Google. 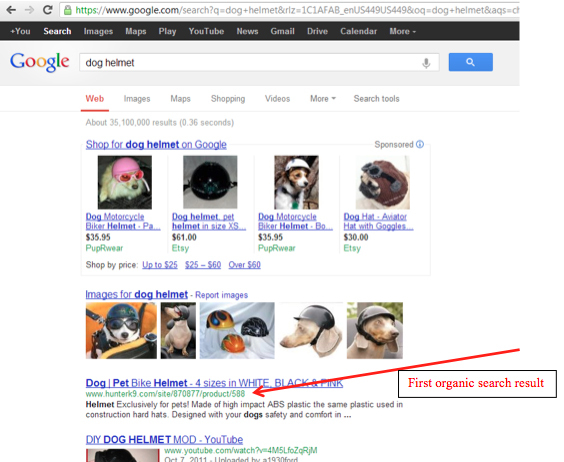 Here’s an example of how that affects a search for “dog helmet.” For this search, Google has a row of sponsored thumbnail pictures pulled from their shopping section and a row of images for dog helmets before they ever get to the first organic result. Someone using a standard monitor or laptop won’t even see the website like Rockstar Puppy in the third spot of organic results without scrolling down. Consider how the sponsored ads might affect the amount of traffic and business the website gets, and ask yourself if the average user would be able to tell the difference between an ad and organic result. Search engine users are the ones losing out here while search engines profit from the ads and sponsored content. Maybe it just means that until there are better measures in place to protect consumers—and even after there are—consumers need to be smarter about their Internet use. Google and every other search engine is a business when it comes down to it, and they have to turn a profit. Unfortunately, that seems to be at the expense of their original mission as a search engine. Let’s hope that they do decide to move back toward their earlier “don’t be evil” days and make changes to their disclosures. However, if you’re going to be concerned about informing consumers, should that extend to the SEO industry too? At this point, getting a top 10 Google ranking in organic search results is pay-to-play. Businesses that want to show up on the first page of Google have to use a professional SEO company, have an SEO consulting expert on call or their own in-house SEO to be successful. A small percentage of search engine users have probably heard of SEO but how many of them could actually give a working definition of what SEO does? When they type in a search query, people trust that the results provided are the most relevant to their search. But when businesses and companies have to have an SEO campaign to compete—even one that is squeaky-clean—that isn’t necessarily true. What do you think, do consumers deserve to know about SEO and how it effects search results placement? Good post about Google and Bing. Bing has limiting choices and they get ranked by Google. Now Bing had become a good search engine like Google. Very interesting, Google is betraying to the Principe that made them Google, however we can see the same policy in search results for dentist or orthodontist, They are trying to encourage people to get ad on Google. Google results are becming more and more skewiff in in Googles favour. Seems they want it all. There moves into insurance are giving therm an distinct unfair advantage in UK insurance serches but people don\’t have the time to find out the ins and outs of it all. Search Engines deliver by Crawling based on Key word and some more Algorithms. The result are determined by the Content, ,Key words and good tagging. It is also true that these alone do not make your site or writing to show up in the top results for a Search. One can find inaccurate information, some times even irrelevant to the query as a result in top results. May be this has something to do with set Algorithms. This can not be avoided. Either the results are due to content, tagging and key words-some times written artificially to draw traffic. The other is the Search engines promote Paid content/ads. You can not avoid it. If the result of a search gives you a bad content, one makes sure he does not visit the site again and he refines the search and goes to the other results. PS.I am not a professional SEO Man.